NASA says the greenhouse effect is “trapped heat” resulting from sunlight warming the planet’s surface, and that the planet cools at night. I’ve been pointing out for a decade that this is ridiculous, and that the heat on Venus is due to high atmospheric pressure. Venus surface receives no sunlight for more than six months at a time during the long Venusian night, yet the temperature does not drop. The distance to Venus from the sun plays only a small role in the cause of its elevated heat wave. Temperatures on Venus remain consistent over time. For one thing, the planet takes 243 Earth days to spin once on its axis (and it spins backwards, at that; on Venus, the sun rises in the west and sets in the east). The nights on Venus are as warm as the days. 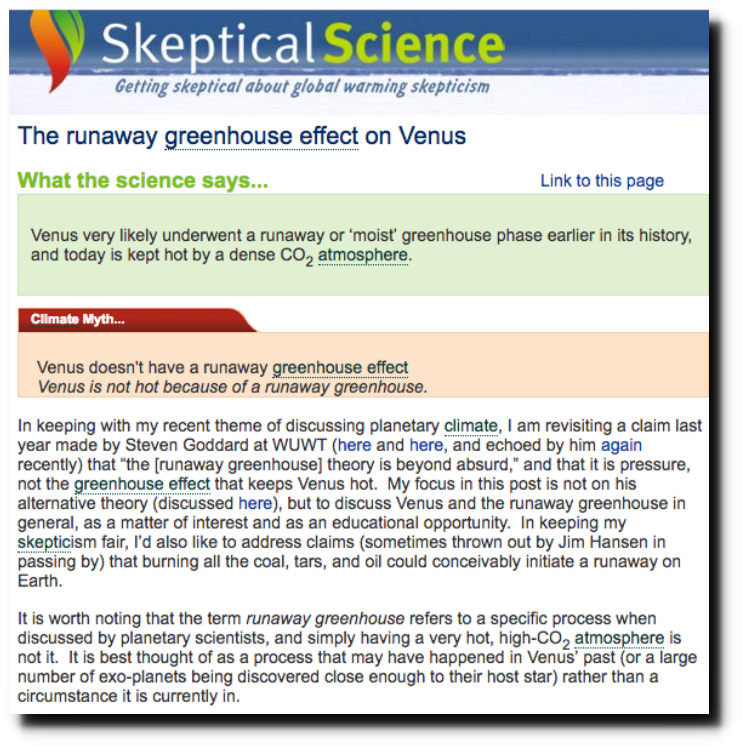 NASA has known since 1971 that a runaway greenhouse effect is impossible. And the US government has understood that global warming theory is nonsense, since the year Bernie Sanders was born. The lapse rate on Venus is very similar to Earth, despite vastly different atmospheric chemistry. The lower atmosphere of Jupiter is extremely hot, despite Jupiter being almost half a million miles away from the Sun. Mars has a 95% CO2 atmosphere and is much closer to the Sun than Jupiter, yet is extremely cold. The only property of a planetary atmosphere which is useful for predicting temperature is atmospheric pressure. The primary factor controlling planetary temperature is the atmospheric pressure. 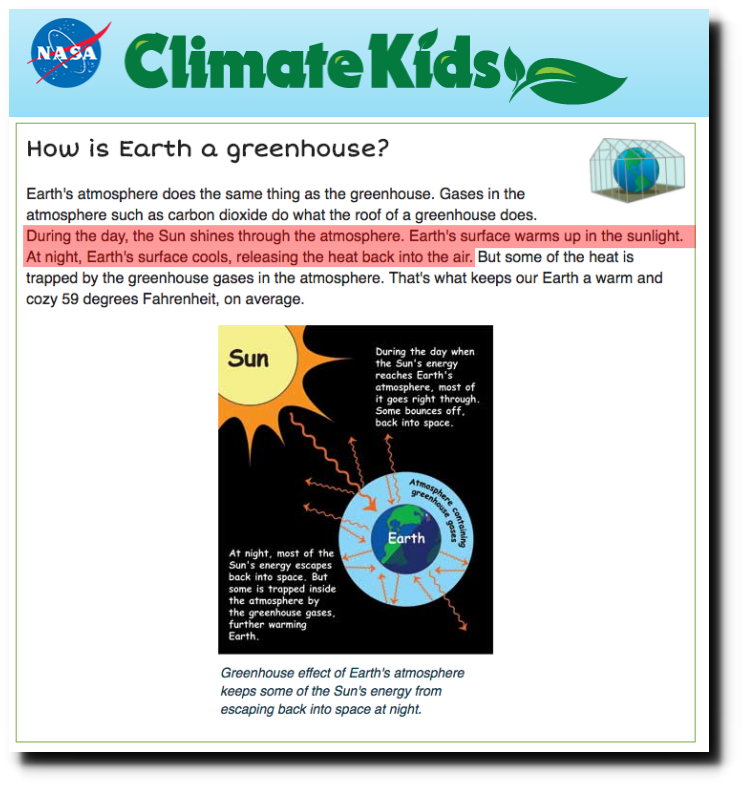 It is not the greenhouse effect. It is not the distance from the Sun. It is time to end this superstition. Venus is hot because the atmospheric pressure is nearly 100 times higher than Earth. Got it, but would Jupiters lower atmosphere be hotter if it were closer to the sun – say orbiting at Earth’s distance? 12,005 degrees instead of 12,000 degrees? That is fascinating to me and totally counterintuitive – thanks for insights. Simply check out the ideal gas law, PV = nRT, which correlates pressure to temperature—something which these blathering nincompoops conveniently ignore. A typo maybe, Jupiter is a half a Billion miles from the Sun. This backs up Tony’s post well, an oldie from Alan Siddons. When I was young, I read a story, part of a science fiction series featuring a young scientist/engineer. They were quite common in those days. Anyhow, in one of these stories, the hero caught the villain publishing a scientific paper with made-up data. The villain didn’t care very much, though. He would just go onto the network (not using those words since the Internet hadn’t been developed yet) and change all the copies of his paper to have the corrected data in it. I couldn’t conceive of a world in which such a thing could be done, nor gotten away with if it could. Now, 40 years later, I find that we are in just such a world. Adding to the “Δ33C without an atmosphere” (see other article) that completely ain’t so is the example of Venus. Venus is 70% of the distance to the sun so its average solar constant/irradiance is twice as intense as that of earth, 2,615 W/m^2 as opposed to 1,368 W/m^2. 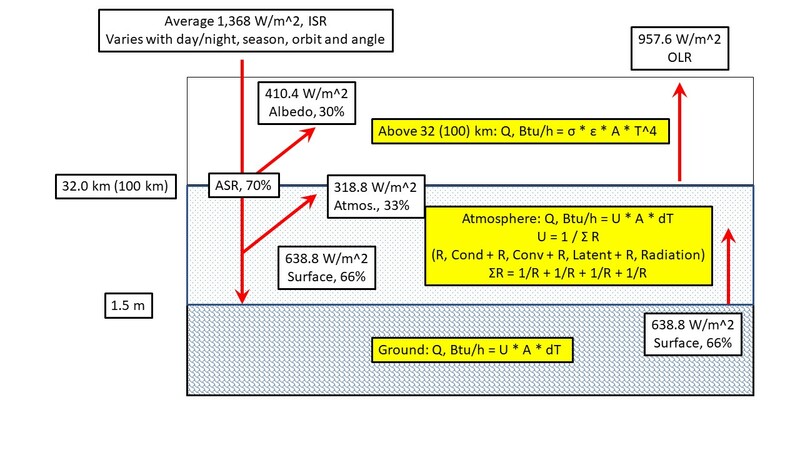 But the albedo of Venus is 0.77 compared to 0.31 for the Earth – or – Venus 601.5 W/m^2 net ASR (absorbed solar radiation) compared to Earth 943.9 W/m^2 net ASR. The Venusian atmosphere is 250 km thick as opposed to Earth’s at 100 km. Picture how hot you would get stacking 1.5 more blankets on your bed. RGHE’s got jack to do with it, it’s all Q = U * A * ΔT. 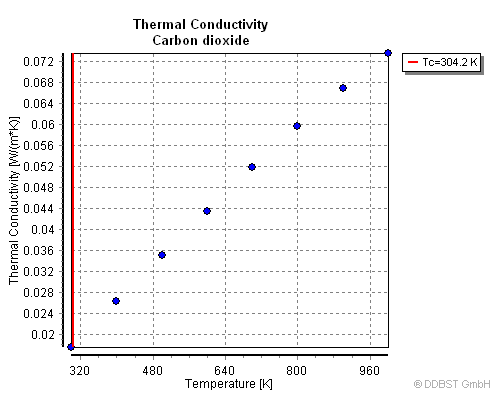 The thermal conductivity of carbon dioxide is about half that of air, 0.0146 W/m-K as opposed to 0.0240 W/m-K so it takes twice the ΔT/m to move the same kJ from surface to ToA. Put the higher irradiance & albedo (lower Q = lower ΔT), thickness (greater thickness increases ΔT) and conductivity (lower conductivity raises ΔT) all together: 601.5/943.9 * 250/100 * 0.0240/0.0146 = 2.61. So, Q = U * A * ΔT suggests that the Venusian ΔT would be 2.61 times greater than that of Earth. If the surface of the Earth is 15C/288K and ToA is effectively 0K then Earth ΔT = 288K. Venus ΔT would be 2.61 * 288 K = 748.8 K surface temperature. All explained, no need for any S-B BB RGHE hocus pocus. Simplest explanation for the observation. While I applaud your approach, please help me understand how thermal conductivity (k) can be used to estimate changes in a convective heat transfer coefficient (UA)? Using the Earth’s atmospheric values for the thermal conductivity of CO2 on Venus is hardly appropriate, the value at 750K is much higher (even if you ignore the enhancement near the critical point). Also you appear to regard the ToA as 100km, i.e. the mesosphere, the temperature there is ~190K not 0K. I would suggest you revisit your calculation. My observations about Venus weren’t meant to be a rigorous analysis, perhaps even a bit tongue in cheek. However, there are a couple of important points. 1) At first glance it seems Venus, being closer to the sun, should be hotter than Earth. But the relative albedos make the energy entering the atmosphere/surface less for Venus than for the Earth. This emphasizes the function and power of the albedo. Geo-engineers even propose changing the albedo with aerosols to reflect more energy and cool/counter the non-warming of CO2. Beware of unintended consequences. So, the albedo/atmosphere does not warm the earth per RGHE, but cools the earth per that aluminized sun shade behind the car windshield. The albedo thermostat works just fine by itself. As snow/ice/clouds increase the albedo and reduce ASR, the atmosphere cools producing more snow/ice/clouds a positive feedback could eventually tip the earth into an ice age, its historically preferred and natural state. As snow/ice remove moisture from the atmosphere, cloud cover decreases, albedo decreases, more ASR and everything heats up melting the snow/ice, and temperatures go up. The albedo and water (THE BIG DOG GHG!!!) cycle is a self-balancing thermostatic loop, no non-water GHGs involved. 2) The thickness of the insulating blanket (atmosphere) matters regardless of its specific conductivity. Say the furnace firing rate at your house is fixed. Double the insulation from 3” to 6”, install double pane windows, and the house is going to get very hot. What usually happens is the heat loss through the walls drops and the energy needed to maintain 70 F goes down as well as the gas bill. 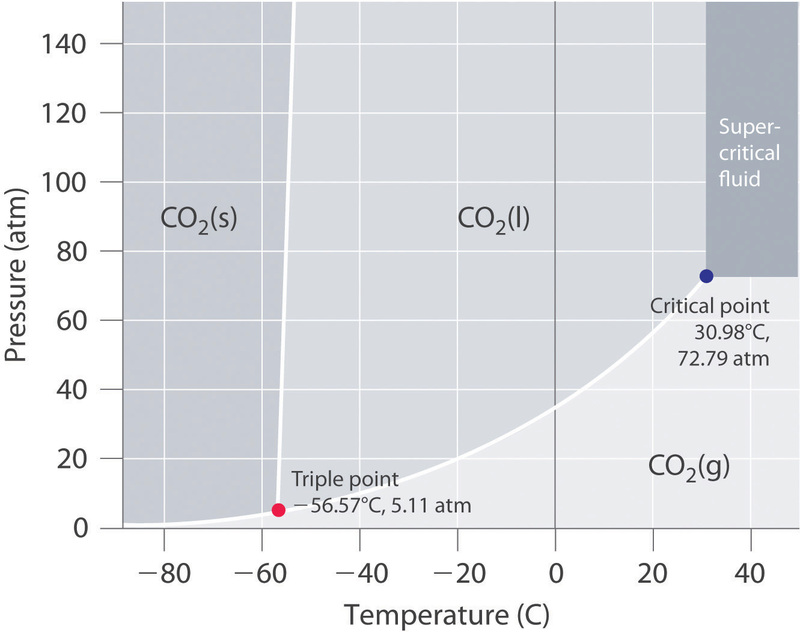 3) What is the thermal conductivity of CO2 at 750 K? Doesn’t really matter, it has one and what really counts is the average for the 250 km thickness. This determines the dT, surface to ToA or the vacuum of space at 3K. A detail to be resolved. For the Earth, molecules end at 32 km where straight radiation takes over and -40 or -60 C not 0 K. The same needs to be determined for Venus. 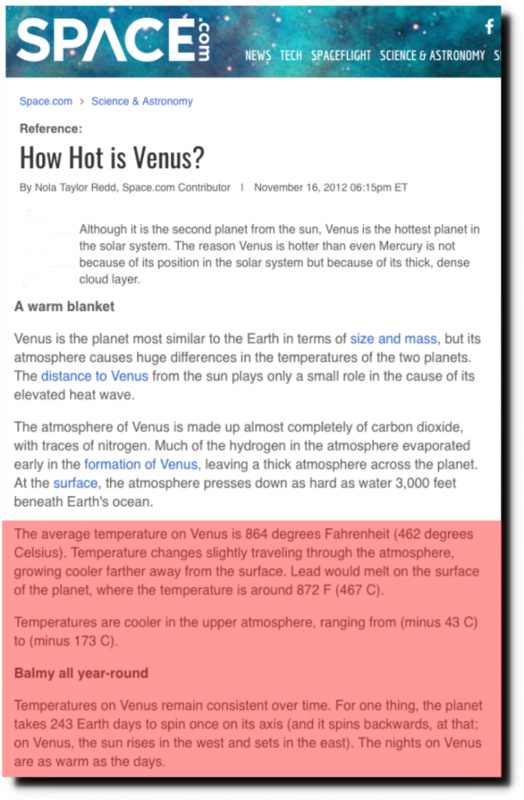 Venus ΔT would be 2.61 * 288 K = 748.8 K surface temperature. All explained, no need for any S-B BB RGHE hocus pocus. About which you say after the fact: “My observations about Venus weren’t meant to be a rigorous analysis, perhaps even a bit tongue in cheek”. What is the thermal conductivity of CO2 at 750 K? Doesn’t really matter, it has one and what really counts is the average for the 250 km thickness. Near the surface the CO2 is actually super critical which further enhances the conductivity. This determines the dT, surface to ToA or the vacuum of space at 3K. A detail to be resolved. For the Earth, molecules end at 32 km where straight radiation takes over and -40 or -60 C not 0 K. The same needs to be determined for Venus. So you no longer believe that the ToA is 0K, which you stated above. Also molecules do not ‘end at 32 km’, that’s the middle of the stratosphere, and radiation loss dominates below the stratosphere. 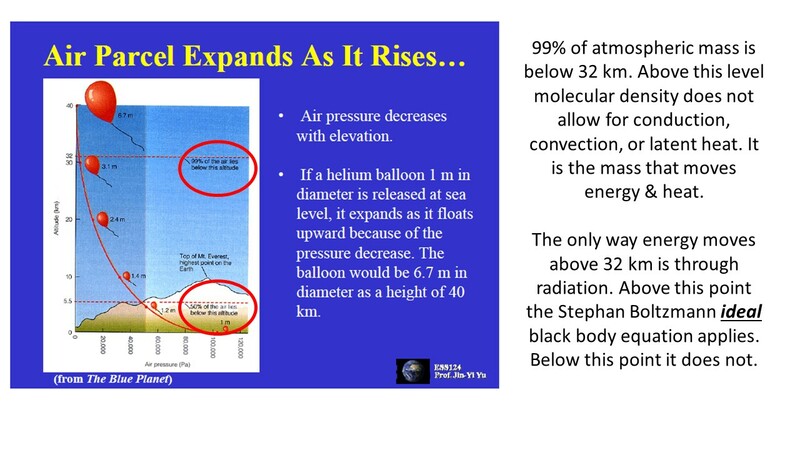 99% of the atmospheric molecules are below 32 km. Which is also moot. 1) 288 K – 255 K = 33 C warmer w/ atmosphere. Explain, justify, defend this concept – or not. 2) LWIR “back” radiation of 333 W/m^2 per K-T diagram. Explain, justify, defend this concept – or not. If 1) and 2) are indefensible, and they are, RGHE theory goes straight into the trash. Comparing atmospheric temperatures of Venus and Earth at equivalent pressure confirms what TH is saying. I believe you should go to town on this, Tony. Do a definitive video. You know Ned’s views and that his paper demonstrates how half a dozen different planets and moons in our solar system share very close temp’ signals at similar atmospheric pressure, despite multiple different atmospheric compositions, surface pressures and distances from the sun. So many different variable parameters across multiple celestial bodies, yet for all those temps to be correlated is simply NOT a coincidence. Statistically it cannot be plausible. This kills the greenhouse theory based on observations across our entire solar system stone cold dead. It’s the checkmate to end all checkmates. Time to end this game. Gravity and friction makes a huge amount of heat on Venus. It has no plate tectonic, sometimes the whole surface melts. Io, the closest moon at Jupiter also gets very hot in that way. Shouldnt that be, Jupiter is half a Billion miles from the Sun (484 million miles) ? I agree with you, Tony. I have also read that the heat of Venus is due to 1): The pressure, and 2): That it is close to the Sun, and 3): The gravitational friction. Take a cubic block ‘o stuff with a bazillion molecules in it and compress it to one fourth the original volume. The kinetic energy and temperature of those molecules will increase. Air compressors do this all day long with intercoolers and after coolers removing the heat of compression. I haven’t seen evidence of Venusian air compressors. An electrical circuit is a complex mix of resistors, capacitors, inductors, transistors, etc. which pose a combined resistance to current flow that requires a voltage difference. Capacitors are similar to hydraulic surge tanks that absorb and release energy as the process requires. The atmosphere is a complex thermal circuit with conduction, convection, latent energy of water condensing and evaporating energy like a capacitor, radiation, etc. posing a combined resistance to thermal flow that requires a temperature difference. At least up to 32 km where the molecules run out and radiation takes over. The surface temperature is greater than the ToA temperature because the thermal resistance of the atmosphere demands it. By reflecting away 30% of the incoming solar radiation, the albedo/atmosphere keeps the earth cool not warm per RGHE theory while Q = U A dT makes the surface warmer than ToA. Gravity is the compressor that drives the Earth’s (and other planets and moons) temperature. It is constantly doing work on the atmosphere just like a compressor. The heat is removed into space, the ultimate intercooler. I am still dismayed that this [the GHE] has been allowed to persist at NASA ans NOAA. We have had our fill of “fake news” and “fake science” . The swamp has still not been drained. Come on President Trump, get with it and drain the NASA and NOAA swamp. The atmosphere/temperature/pressure on Mars should be included in this discussion. Mars’ atmosphere is 95.9% CO2. And yet…during its winter, the CO2 FREEZES. How’s that magical molecule theory stand up to those facts? The Martian “atmosphere” is so thin calling it an atmosphere is pushing it. There are dust storms on Mars, so that’s good enough for me to intuitively accept that it’s really an atmosphere. The moon has an “atmosphere” too, but that really does fail the intuitive definition of an atmosphere for me. “Dust storms”, actually electromagnetic plasma currents discharging with the surface of the planet, not atmospheric disturbances. The gravity based thermal effects seem to hold true in atmospheres where the pressure is greater than 0.1 bar. Mars is a very interesting example because the real difference between Mars and Earth, is that Earth has large amounts of non GHGs Nitrogen, Oxygen and Argon. If one were to remove all the non GHGs from Earth’s atmosphere, it would be left with an atmosphere of similar density and pressure as that of Mars! Mars whilst it has a small atmosphere, on a numerical basis, it has more molecules of GHGs than Earth. Put simply 96% of a small atmosphere is an order of magnitude more than 0.04% of a large atmosphere. Even when one includes water vapour, Mars still has more molecules of GHGs. Despite all this, there is no measurable GHE on Mars why is that if Mars has more molecules of GHGs in its atmosphere and those molecules are more tightly spaced together (since it is a smaller sphere) such that LWIR radiating from the surface of Mars will find it more difficult to make its way to TOA of the Martian Atmosphere since it will encounter many more molecules of GHGs on its way from the surface to TOA?. The magical carbon-spewing-molecule-of-death is 96.5% of Mars’ atmosphere. Were you to count the molecules, there would be more CO2 in Mars’ atmosphere than in Earth’s. Does that not falsify the “CO2 is a heat-trapping demon” theory? Maybe, but solar irradiance on Mars is < half that of Earth's. That is not entirely correct. Whilst solar irradiance at TOA is very much less than on Earth, Mars has little in the way of clouds and hence the albedo is very different, such that solar irradiance at the equator under the clear skies of Mars, is more like 60 to 65% of that of Earth. But the point is not that Mars is cold. Obviously being further away from the sun it is bound to be considerably colder. The point is that no enhanced GHE has been measured on Mars. On Earth the enhanced GHE is said to be abort 33degC and this is said to be due to the GHGs in Earth’s atmosphere. Given that Mars has more GHGs and if GHGs truly cause an enhanced GHE, why do we not see say a 5 degC or 10 degC or perhaps even 15 degC enhanced GHE on Mars? But there is nada. The reason Mars is cold is because it does not have a dense, thick atmosphere with thermal capacity and lag. When one reads papers on geoengineering the atmosphere of Mars to make the planet more habitable, these discuss making the atmosphere thicker and more dense. They do not say that Mars needs more CO2 say 99% CO2, but rather that it needs a more massive and denser atmosphere. Admittedly most theoretical projects involve melting the ice caps, and the ice caps are largely made up of CO2. But it is not the CO2 per se that is wanted, but rather the release of molecules to make the atmosphere more massive and denser to create thermal capacity and lag. These papers come very close to acknowledging that it is mass/density of the atmosphere that causes a planet to be warm. I have seen the argument for atmospheric pressure on Venus before. It is obviously a sound argument. I am not familiar with formula Q = U * A * ΔT, so I am not sure what is being said. I assume from ΔT it concerns the flow of temperature from a warmer body to a cooler body. That is an interesting concept to me. Such equations typically show heat only flows from hot to cold. They also show the rate of energy flow can be reduced. The idea of a colder body warming a warmer body is nonsense. However, reducing the rate of flow isn’t. Such equations appear to be correct when used in their theoretical context. However, the actual context we exist in does not conform to the theoretical context. The incoming energy isn’t one set number, it is a variable dependent upon time and location. About half the globe is receiving no energy from the sun at any given moment. Out flowing energy isn’t a set number either as the earth is not uniform in temperature. The night time out flow from the equator would obviously be greater than near the poles. I don’t see how anyone can calculate the actual surface area involved in this. Take as a golf ball as an example. Due to the dimples the surface area is greater than that of a simple sphere of the exact same diameter. What is the actual surface area of a square yard of sand? Then there is the fact much of the outflow of radiant energy from the Earth is directed towards what is essentially empty space where even the concept of temperature has no real meaning. Yes, if you travel far enough you have a probability of light hitting a planet or star. But at the distances involved would this not be pretty close to just passing through? In other words ΔT would functionally equal T. In such a state, a large mass of cold air can radiate a tremendous amount of energy. Remember, all matter which is not at absolute zero radiates energy. Even O2 and N2. The idea only GHGs radiate energy is patently false. I haven’t even mentioned difference in albedo or in heat capacity of a surface or the specific heat of differing materials around the world. Or in calculating the energy / temperature relationship of a column of air miles in length with variable amounts of water vapor or water molecules along a pressure gradient. My point being the greenhouse gas theory is predicated upon the supposed difference between what the “temperature of the Earth” should be and what it is. Aren’t both of those statements a little problematic? 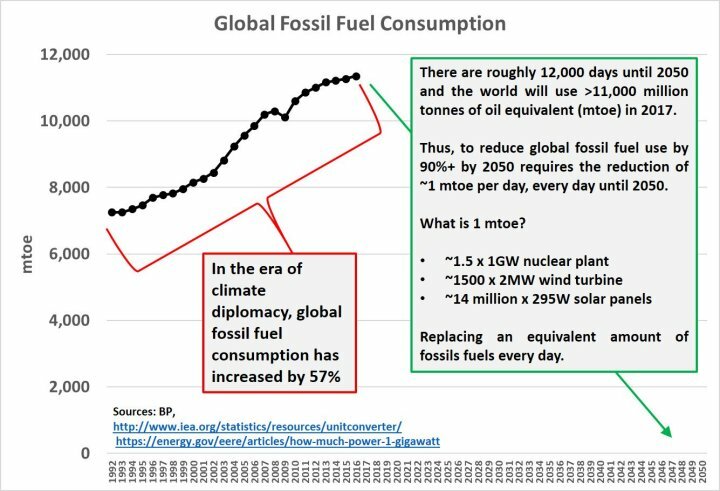 Are you really going to accurately tally up every bit of energy actually contained in just the atmosphere? Or is it more likely such calculations are of necessity flawed. The equation describes the heat flow through the walls of a house, for instance, or an insulated vessel, etc. The k or U value if all of the components between the hot and cold reservoirs, the ONLY direction energy moves without the addition of work. Gravity is constantly doing work on the atmosphere. If it was not, the atmosphere would simply float off into space. Your example of a compressor is spot on, but not for the reasons you state. Gravity is acting like your theoretical compressor constantly doing work on all atmospheres. Where’s the 480 VAC outlet powering that work? Earth at 287K, heat flow @ 383W/m²=4g², solar heating @ 1360.8W/(4/3)=4/3*8g². The higher the density of matter the more time the object needs to heat up or cool down. We have a huge mountain outside of my gown and a huge cave inside. The average temperature inside this cave is almost the same throughout the whole year ,no matter wether it is summer or winter((i live close to a ski resort and swim in our lake during sommer=remarkable temp. differences)). If the sun would stop shining for 1 week,all people in my town would freeze to death except those inside the cave as the isolation inside this cave would keep the temperatures much longer-and the reason is not that the mountain is made of co2(it is not)-but the density slows down the impact of outside temperatures a lot. There are some other factors (eg reflection) but even when they are part of the game the “ballistic” path is similar. = a black cube in the sun will heat up a lot faster than a white but also cool down a lot faster than the white one. But in general: the fast something gets hot the faster it will cool down. And density of matter(besides specific elemental “skills”) is regulating how much time electromagnetic waves need to enter and leave the system. More technically, it’s a function of heat capacity and thermal conductivity, in addition to temperature and other environmental factors. Interesting. There is also the concept of specific heat, which is defined as the amount of energy required to raise the temperature of a unit mass of material by 1°C. Note that is mass, not volume and not weight. The specific heat of water or salt water is over 4 times that of air. It is many times higher than plain dirt, I don’t remember exactly by how much. Water is actually an exceptional substance in this regard. Relative to other matter, water acts as an energy battery or sump. It acts to keep temperatures down during the day. At night, it acts to release that energy into the atmosphere for a much longer period than the ground and other surfaces, thus keeping the air warmer. This holds true for both water vapor and for water molecules suspended in the atmosphere. Also true for moisture content in soil. To your point, moist soil is also more dense than dry soil. Two examples of this come readily to mind. Most fishermen that hit the lake in the pre dawn hours know it is common for a lake’s surface to be much warmer than the ground. You can actually feel the air become warmer over the water as well as often seeing mist coming off the water. The other example is that of a desert. The dry air and soil is why it becomes very hot during the day time yet at night the temperatures can plunge quickly. Soldiers fighting in North Africa during WWII found out about that. It actually caught the Americans unaware. How very strange to find you need cold weather gear in the blazing deserts of North Africa. One of the major differences between our Earth and other planets is the amount of open water on the surface. If you were to construct a second theoretical Earth occupying the exact same orbit where the only difference was the amount of water surface, let’s say 10% instead of over 70%, that second Earth would be much warmer in the day time and much colder at night. I would also guess summer highs would be much hotter and winter lows would be much colder. But, would the average temperature be the same, lower, or higher? I would guess the average would be higher because of lower cloud cover. Latent of cond or evap = 1,000 Btu/lb at constant temperature. Compare the daily highs and nightly lows between a desert area and a wet tropical area along the same latitude. Despite receiving similar amounts of solar energy, the desert area gets hotter during the day but colder during the night. The diurnal temperature range at the tropics is low and at a desert high. Earth/Moon comparison shows the same thing. It gets intensely hot within 6 hours of sunrise, and very cold within hours of sunset. It’s the water, has always been the water and will always be the water. The Earth is like a Greenhouse with the tropopause as the glass ceiling. Water on the ground, in the air as vapour and clouds, moderates the extremes of temperature to make it livable for present life. I think I have that. I ended up going to this article. I have been familiar with the absorption wave lengths for CO2 for a long while, I have been familiar with the concept CO2 is a relatively cold molecule, but I did not have the concept of emissive wave length tied to temperature. If I read that right, CO2 absorbs infrared light centered on basically 3 narrow bands, the largest of which equates to -80° C. After that you are looking at temperatures over 320° C.
CO2 absorbs very little in the normal temperature range of Earth’s surface. That really should be the kill shot on the theory. It really only comes into play where you have Antarctic type temperatures. Or current Siberian temperatures. You have been misled, there is no relationship between -80ºC and the absorption of the CO2 band, CO2 absorbs light emitted by the surface at 300K+ and also emits at 300K. The concept of CO2 being a ‘cold molecule’ is a fallacy. The Arctic ice isn’t going anywhere. See DMI & NSIDC data. Shrinks every summer, grows every winter same same for decades. Zero significant trend. It isn’t going anywhere because of the geometry of the planet. Given the tilt of the axis, there will always be lengthy periods when no or little solar irradiance is received and hence the ice recovers. There needs to be a very vast shift in conditions for the poles to become ice free. Given the present layout of the tectonic plates, it is not easy to envisage such circumstances. Tony, is there a verbal typo on 7:50 when comparing Venus and Earth’s atmospheres? The idea that runaway global warming is demonstrably impossible is proven by the fact that earth (a) is essentially a closed system to most gases and (b) it’s experienced CO2 levels of >7000 ppm in past epochs without having experienced a runaway warming scenario when the incoming solar insolation was even higher than today. All that talk is little more than scaremongering by disingenuous liars. If the atmosphere of Venus was pure CO2 and not opaque, there would be large temperature differences between midday and midnight equatorial surface temperatures, as there are on Mars. CO2 has low heat capacity, being about two thirds of that of dry air, and lacks adequate absorption bands to alone maintain a powerful night time greenhouse effect on Venus. Not true on Venus, near the surface CO2 isn’t even a gas, it’s a supercritical fluid and has a higher specific heat than air. Also due to collisional broadening the absorption bans are much broader than they are in the earth’s atmosphere. There’s still the issue of sulfuric acid clouds and albedo. Phil you’re obviously an idiotic clown without even the first moment shadowing a seat in a gas energy class. You have full personal right to be and speak as, an innumerate, illiterate idiot. A right you’re obviously going to insist on exercising. pseudoscientific drivel a child can check and dismiss as the hick spew of public school class political manure. Tell me the parts of the gas law governing gas temperatures or you’re the posing illiterate fake im telling everyone here i can prove you are, with just one question. I’ll wait, you go discover the parts of that law and tell me what they are. I say you’re so stupid you can’t even name that law. Tell me the name of the law governing gas temperatures, thermobilly. Or you’re as fake as the stories you’re in here barking in front of several scientists who ARE gas energy mechanics literate – even fluent. You’re an illiterate fake as will be shown to everyone when you’re so stupid you can’t answer even ONE question about gas mass energy relationships. You’re a fraud barking hick. Put down the flagon, Allen, and sober up so you can write something coherent. Andy anseer for him. Ill wait. What are the two parts of the law governing gas hence atmosphetic temperatures. If you cant, s.t.f.u. Poor Allen, you are barking MAD , up the wrong tree. Do you DENY that CO2 is likely to exist as a supercritical fluid at Venus surface temperature and pressure. Do you not understand a basic phase diagram ? That would probably make the very bottom layer of the atmosphere behave somewhat differently from the GRAVITY BASED THERMAL GRADIENT above. Sorry if you don’t have the scientific background to comprehend. The first part of Phil’s post is probably correct. But above whatever height has a pressure of 73 atmospheres, it would be a gas. Andrew55: answer Schroeder below where he remarks on the Law governing Atmospheric temperature. and now want to be noticed for fighting off the psychosis. You are so thick that you can’t comprehend that the very base layer of the Venus is likely to be somewhat anomalous. very high pressure will still allow the thermal gradient to be maintained. Proof is in the measurements. The largest recorded temperature change in one place over a 24-hour period occurred on January 15, 1972 in Loma, Montana, when the temperature rose from −54 to 49 °F. Tony, you have excelled yourself. Your article affirms what “1000frolly” has been saying for several months (I first came across him when he contributed to a Climate of Sophistry discussion thread). His contribution left the other contributors to the discussion amazed at the simplicity of the revelation. You have the reach to get this message far and wide. Finally, it would be brilliant if, in the future, you could do a collaborative piece with 1000Frolly. Two for one special. Or is that one for two? I’m having a hard time understanding what PV=nRT has to do with the temperature of an atmosphere. It’s called the IDEAL gas law for a reason. It describes the relationship between these physical properties in an IDEAL and CLOSED system which is NOT a typical atmosphere. P is pressure, V is volume, n is the number of molecules, T the temperature and R the IDEAL gas constant that ties them all together. If I want P to increase, I can 1) add more n molecules and/or 2) raise the temperature. An air compressor adds work/energy and can do both. But if the compressed air system now loses that heat to the surroundings, (See, it’s not closed.) the pressure remains, but the heat/temperature does not. Where is that connection that says P is simply/directly responsible for T? If n is constant I can raise P by increasing T. Or let P stay and allow V to increase. If P & n are constant and I decrease V, T must also go down, e.g. the cooling of an expanding gas. If the atmospheric pressure is responsible for the atmospheric temperature why doesn’t temperature follow barometric pressure? Atmospheric temperature can vary from 0 F to 100 F over the year with little variation in barometric pressure. As noted earlier, if I double the thickness of the insulation, dT doubles. If dT begins as 40 F, 70 F inside and 30 F outside, when dT becomes 80 F by going from R6 to R12 and with no change in heat input it becomes 110 F inside and 30 F outside. It is the composite U value of the atmosphere, including convection, advection, conduction, latent and radiation, winds, storms, clouds, albedo, etc. and assorted other thermal properties and behaviors of the atmosphere that control dT. P V = nR T is not sufficient to explain the temperature of the atmosphere, Q = U A dT is. You say “P V = nR T is not sufficient to explain the temperature of the atmosphere, Q = U A dT is” but, like one of my lecturers used to say to students who wouldn’t accept a formula, “Try it, your mother did”. The near-surface temperature of any planetary body with an atmosphere is very easily calculated by measuring just three gas parameters; pressure, density and molar mass. No other data or inputs are needed except for R (8.314) the gas constant. The implications of this and other considerations are that our CO2 has no effect on global temperatures. The ‘Radiative Greenhouse Effect’ is redundant. It is no longer required to prop-up the lie that CO2 explains the difference between Earth’s effective S-B temperature of 255K and Earth’s average surface temperature of 288K. The IPCC, and the cronies that endorse this pseudo-science, are finished. Just three parameters and a constant have them done for. They are finshed. Only in that region where CO2 goes supercritical fluid. A discontinuity occurs at about 78 atms. While I am one of your many fans I have some concerns about your video. Your comment about Carl Sagan buying into Hansen’s “Runaway Greenhouse Effect” BS was on the money! However Sagan was not always stoned out of his mind. Back in 1967 he correctly forecast the surface temperature of Venus using thermodynamics even though he did not know the exact composition of the Venusian atmosphere. He used thermodynamics to calculate surface temperature. Thus the critical constant is Cp (the specific heat of the gas at constant temperature). It turns out that the average Cp of nitrogen is similar to that of CO2 when averaged from the top of the Venusian atmosphere to the surface. This correction was needed when Sagan realized that he has not allowed for the variation of the Cp of CO2 with pressure. 1. Approach it with an enquiring mind, fully open and receptive to new arguments and reasoning. For some, the words may cause some mental anguish, but do not stop until you reach the end of the article: I assure you that the discomfort will be worth it. Do not duck your responsibilities as a free, independent thinker – do not attempt to read the article’s discussion thread to seek self-assurance. 2. Once you’ve read the article do nothing else (but have a cup of tea) and contemplate what you have read. If necessary, re-read the article again in order to allow you to complete your contemplation of what you have read. 3. Judge the article as it is presented to you – no previous concepts or beliefs should be allowed to obstruct your thinking. Be assured, the author has been entirely truthful i.e. he is not attempting to deceive you or allow you to hold a position that differs from his own. All the figures are from actual empirical data. Mankind has successfully landed craft on the surface of Venus, six times. Many more Venus missions have successfully returned atmospheric data. The figures used in the article are NOT theoretical. They are 162 million miles away from a “Thought Experiment”. All you have to do, on your own, with your own mind only, is decide whether what he has said is the TRUTH (remember there’s a difference between ‘truthful’ and ‘truth’). 4. Until you have decided whether what you have read (in just that article) is the TRUTH or is a FALSEHOOD, do not seek to read any other opinions or commentaries on the article or of the author. Remember YOU are an independent thinker. YOU are NOT a lemming. 5. Once you have decided (using only your own rational thinking mind) tell someone of your decision. Be proud to own your decision – if you find you are not proud enough of your decision, perhaps you have no capacity for independent thought / decision making (but beware that this unfulfilment will inevitably leave you with some cognitive dissonance, so you MUST decide – and you are urged do so with your own independent mind, unassisted by anyone else’s thoughts or opinions: just you and the article: TRUTH or FALSEHOOD? 6. Either way that you decide, the cliff-edge is fast approaching when Nature itself will reveal the truth or falsehood of the IPCC’s Greenhouse theory and their computer model projections. Don’t you think you owe it to yourself to be on the correct side of the argument before that time comes? That’s a rhetorical question by the way – your opinions and commentaries are not needed by free-thinking individuals.